(On DVD, January 2005) Don’t be surprised if you start wondering, twenty minutes in the film, how much more of the protagonist you can take. 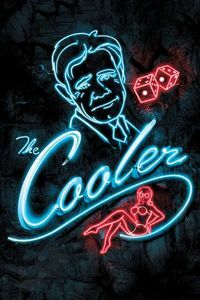 William H. Macy stars as Bernie, a fantastically unlucky man who works a low-rent Vegas casino as a cooler, a man whose bad luck is so contagious it evens up the odds in favour of the house. As you may suspect, this uninterrupted streak of bad luck doesn’t stop at gambling: Romance is similarly impossible, and there is a basic pathetic quality to Bernie’s existence that overwhelms everything else. Bernie is a loser mostly because he’s never learnt to be anything else, and his trouble start once he begins to turn things around. Stuck with an unbearably evil boss (Alec Baldwin), his budding romance with a friendly waitress (Maria Bello) may be his salvation or his doom… depending on where Lady Luck decides to take him. As with most movies dealing with the element of chance, the plot can often be an accumulation of improbable coincidence. But the film gradually improves out of its initial humdrum beginning, using its low-life Vegas locale to good effect. It’s not a spectacular film (despite odd moments of good direction) nor is it something you’ll start cheering for, but it’s the kind of movie that leaves a good impression once the first act is over.